AmeriCommerce online stores offers a few different ways to setup a group of products and to create product kits. Both of these have different objectives. To understand the differences between the two, please review the knowledgebase article "Understanding Product Groups & Kits"
This type of Product Group allows customers to purchase the parent item on the web site, while the system transparently tracks the components of the product for inventory control. For instance, if a store is selling tables, they may stock tabletops and and table legs separately, but they would not want to present the customer with the individual components of table, only the table itself. With this Product Group type, a parent product called Table would be created and it would be responsible for pricing and leg and tabletop products would be created and added to the product group with their required quantities to complete a single table. When someone purchases a table, the price is obtained from the table product and the individual components are inventory controlled transparently to the customer. They will never appear on the table's product page, in the cart, on order confirmation emails, etc. 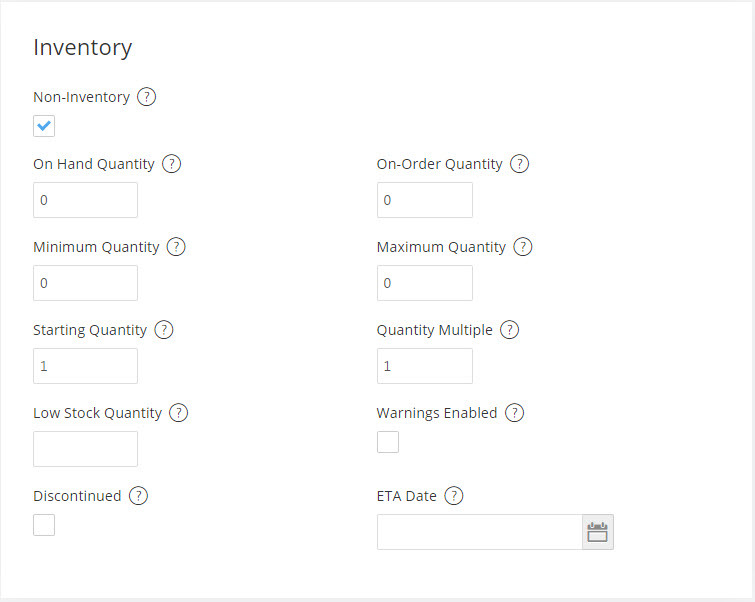 When inventory control takes over to calculate stock on the child products either through an order, a cancellation, or a stock update via the API or a CSV import, the parent product's availability status will be re-calculated based on the child product's required counts. This knowledgebase article describes the Product Group setup as 'Sell Parent Track Item Inventory Transparently' option and how to configure the inventory tracking. 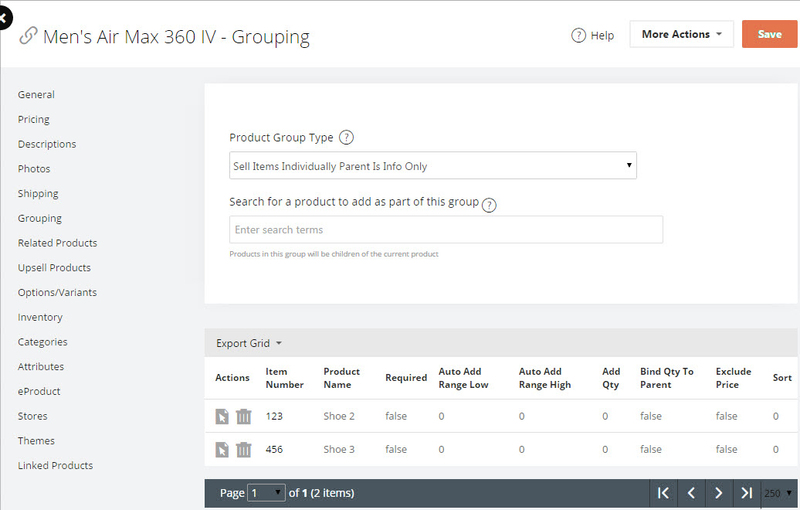 In order to create groups please open the parent product in the Product Editor and browse to the Grouping menu. When you choose this option the parent product (the one you are editing) is not available for sale but the child items are available. 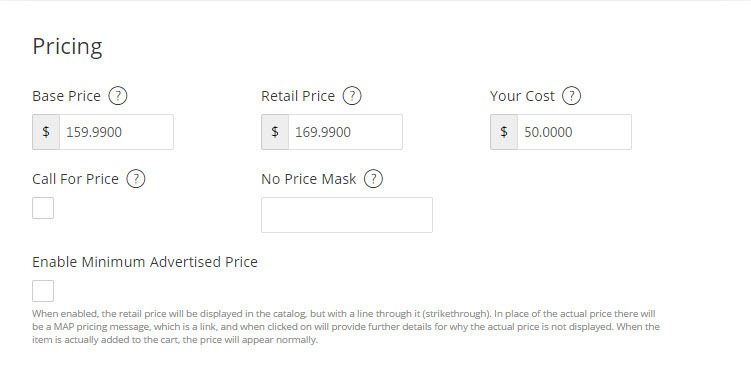 This option used when selling items as a kit. Completely hides the child items from the shopper, tracks inventory on the child items and obtains pricing from the parent. Can also control parent availability based on child availability. Select Sell Parent Track Item Inventory Transparently and then search for products to add to this group. Please ensure you do not include the parent product in this list. Check the Required and Bind Qty To Parent checkboxes and supply the quantity of each item to be included in the group. In our example we have 4 legs and 1 top. Click on the Save button in the top right corner to save your changes.